PITTSBURGH, April 29, 2015 – After a 2 year hiatus, Artist Toby Atticus Fraley has announced plans to bring back the popular public art installation Robot Repair, reimagined for Pittsburgh International Airport (PIT). 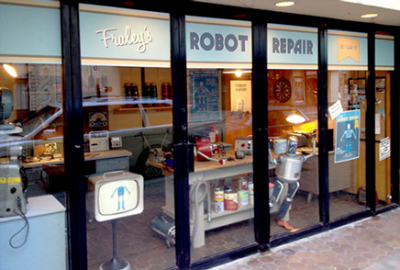 Fraley today announced the launch of a website, www.pitrobotrepair.com, and Kickstarter crowd funding campaign to raise money for the installation. Fraley must raise $10,000 thousand between May 19 to June 17, 2015 in order to fund the project. Individuals who donate, or backers, of the project will receive tokens like stickers, pins, signed prints, or even an art piece from Fraley’s previous installation. The artist says the Allegheny County Airport Authority is supplying the space at no charge on a temporary basis, but public support is necessary for the creation of this new piece of artwork. The PIT installation will be three times larger than Fraley’s original Downtown Pittsburgh site. Situated in Concourse A near Southwest Airline’s busiest gate, A15, construction is slated for July with an opening scheduled for late August or early September 2015. The original installation was part of Project Pop Up Pittsburgh, a collaboration between the mayor’s office, the Urban Redevelopment Authority, Department of City Planning, and Pittsburgh Downtown Partnership to fill vacant storefronts with start-up businesses, art installations, or performances as a means to attract permanent tenants. After an 18 month run in Pittsburgh’s Cultural District, Fraley’s Robot Repair and the adjacent vacant restaurant later became the restaurant Butcher in the Rye. Toby Atticus Fraley is an artist born in Washington, PA in 1977. Currently, he lives in Bridgeville, PA where he maintains a studio as a full time artist. His work consists of mixed media sculpture, public art pieces, electronic/interactive sculptures, and Americana themed oil paintings. Toby’s most recent project, The Artwork Forge was just shown in Scottsdale AZ, commissioned by Scottsdale Public Art and Arizona State University. Recent exhibitions featuring his work include The Pittsburgh Biennial, Art in Odd Places: Indianapolis, SOFA in Chicago (Represented by the Pittsburgh Glass Center) and a solo show at SPACE gallery in Pittsburgh entitled, The Secret Life of Robots. Dieser Eintrag wurde veröffentlicht in Crowdfunding, Fun, General von Sebastian Trella. Permanenter Link des Eintrags.